The firm operated from this address between c.1866 – 1913. Held at the Penitentiary Chapel Historic Site, Campbell St. Hobart, Tasmania, site of the former Hobart Gaol and Supreme Court. 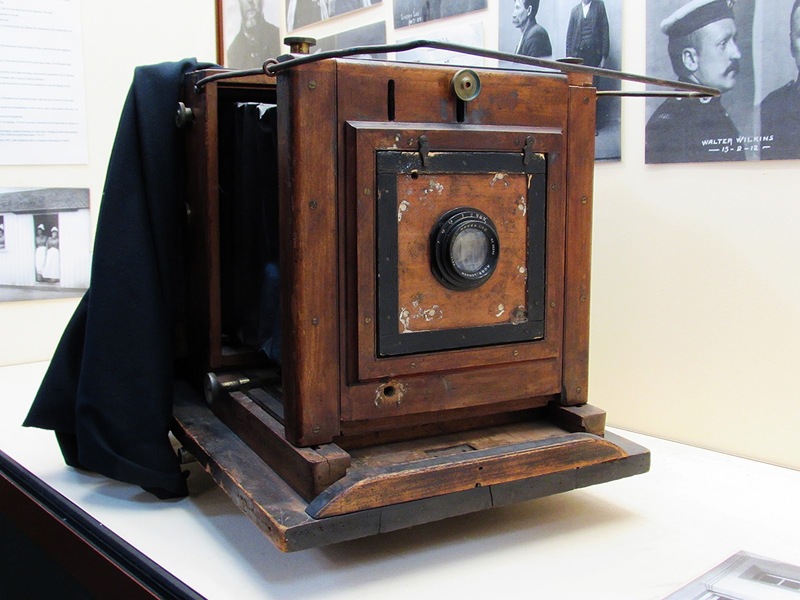 This camera was used by the (as yet) unidentified photographer at the Hobart Gaol from the 1890s. 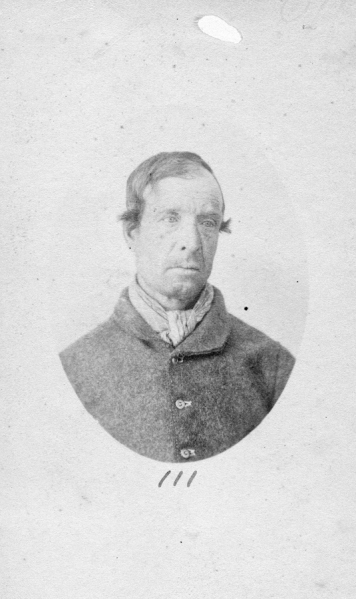 Prior to the 1890s, prisoners were photographed by Constable John Nevin who was resident at the Gaol until his death from typhoid fever in 1891, working with his brother, commercial photographer and civil servant Thomas J. Nevin who attended the gaol and Supreme Court Oyer and Terminer sessions on a weekly roster. They used two rooms above the women’s laundry as a studio. The cameras they used were wet plate, multi-lens cameras such as the 1860s American Scovill (possibly Peck) style wet-plate camera with four Darlot No.4 lenses, a Simon Wing ‘Repeating’ camera, or a stereoscopic, sliding box type, wet plate (wood, brass & glass), by Ottewill & Co, lenses manufactured by A Ross, London, England, 1860 – 1870. 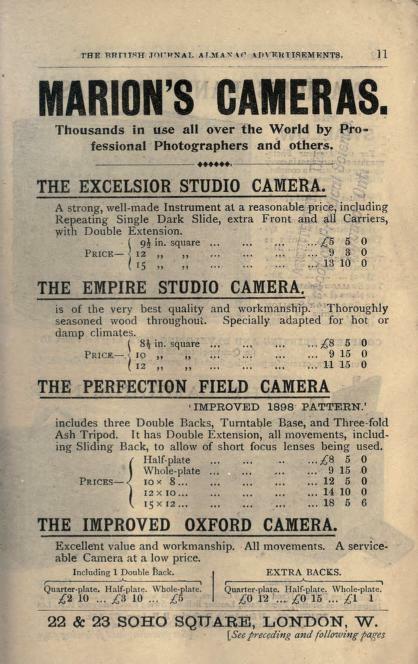 Advertisement for the Marion Excelsior Studio Camera 1898, available in 9½, 12 and 15 square formats. with repeating single dark slide, extra front and all carriers with double extension, priced from £5.5 to £13.10. 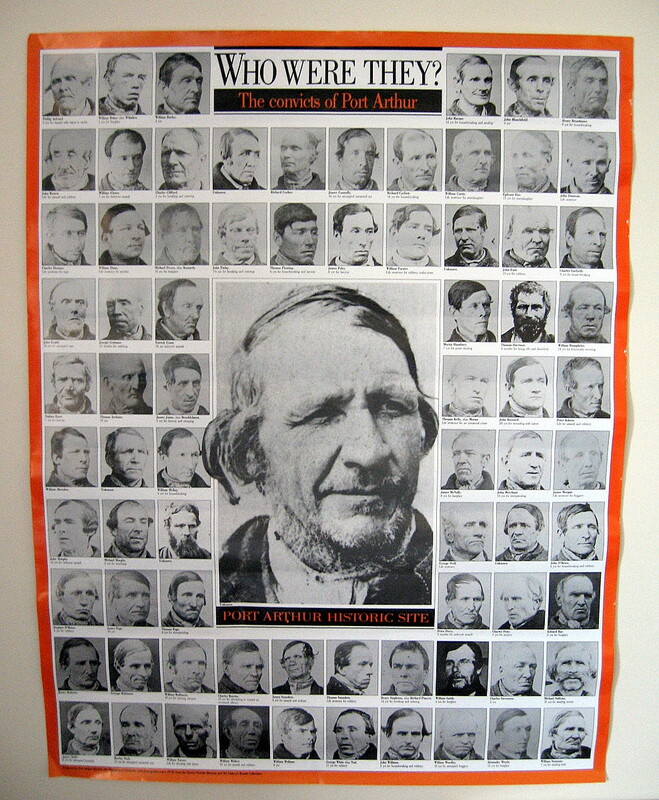 During the famous Conlan case of 1895, in which a scam and fraud was attempted on the estate of an old ex-convict John Conlan who had lived life as a pauper but died apparently having hoarded a small fortune, the attention of Parliament was drawn to the irregular presence of newspaper photographers from the Tasmanian Mail taking photographs of the four accused inside the court room. The Attorney-General’s response was that he had given the press permission, although his recall about the details was hazy, and asserted in any case, that the taking of photographs of persons arrested both before conviction and after it was customary. 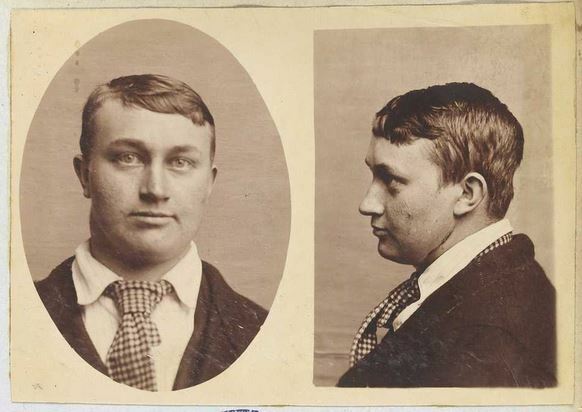 The objection to being photographed before he was found guilty had been raised by one of the accused, John Marchant Frazer of California, arrested on suspicion, found guilty in the course of events, and sentenced to six years’ imprisonment at the Hobart Gaol. The concerns voiced in Parliament regarding the impropriety of photographing persons both innocent and under suspicion, as well as the disregard of personal privacy and the potential harm to personal reputation, was punctuated with a some very witty comments and loud outbursts of laughter. This transcript of the session gives a very clear idea of how commonplace the photographic image had become for the police and judiciary by 1895. TAKING PHOTOGRAPHS IN THE POLICE COURT. The Police Magistrate said it was by the order of the Attorney-General. (Loud laughter.) It might be a laughing matter to some, but it was not so to those concerned. The prisoner Frazer said he “objected to having his photograph taken before he was found guilty. ” The Police Magistrate subsequently said that to have a camera in the court was most unseemly, and if the Attorney General was there he thought he would not allow it. Mr. Winch asked that if the photograph had been taken it should be de- tained in court. Now he would like an answer from the Attorney-General as to whether any gentleman, especially if he was connected with the press, had the right to go to the Police Court to take a photograph of anyone charged on suspicion as a guilty person. The ATTORNEY-GENERAL: Permission was asked for, and granted by me. It is the custom to photograph persons arrested both before conviction and after it. Mr. URQUHART : It’s a piece of cheekiness. Mr. BROWN : I think it time such a practice was put an end to. Mr. URQUHART moved the adjournment of the House in order that the matter might be discussed. He thought such a practice might result in innocent persons being ruined. He was not aware there was any law by which photographs could be taken in this way. 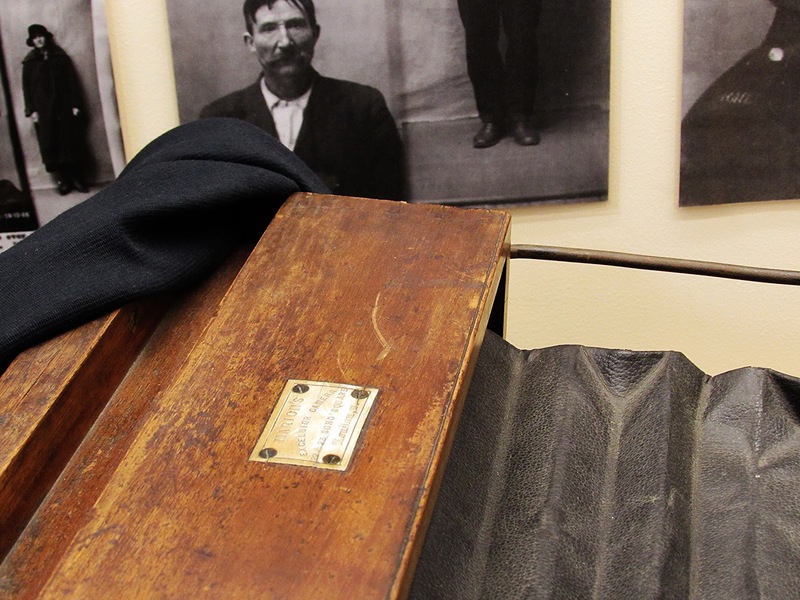 When a man was found guilty he was in the hands of the gaol officials but not before. Many a man was arrested on an unfounded suspicion, and he would like to know why there should remain in the hands of the gaol officials an imprint of that man’s features. It was highly derogatory to the administration of justice that photographers should be allowed into the Police Court to take photographs. The PREMIER could not say what harm could arise from an innocent man having his photograph taken. They all had their photographs taken all their lives, and sometimes without permission. (Laughter). He would second the motion for the sake of discussion, because he was sure the Hon. member would withdraw it when he was told that this was a practice not peculiar to Tasmania -( laughter)-but common throughout a considerable portion of the world. The practice was, after all, a very harmless one, and the use of a camera did not make a man guilty. Mr. BROWN said that was a very different thing from holding innocent persons up to public condemnation. No man’s likeness should be taken as a prisoner until he was found guilty. So long as he was an innocent man let him remain so. He hoped steps would be taken to prevent anything of the kind in the future. Mr. MULCAHY said that he agreed with the police magistrate, that it was unseemly to take the photograph of a prisoner in court, otherwise he could not say that there was any great grievance. Mr. MULCAHY: I should not regard being photographed as a grievance at all. The ATTORNEY-GENERAL: I gave permission to take photographs of the four accused. I did not know when or where, and I did not think it would matter much. I do not want to create any unseemly scenes in the Police Court, and I do not apprehend that there was one. I am sorry to hear that in the opinion of the Police Magistrate an unseemly incident occurred. The motion for adjournment was put and negatived. 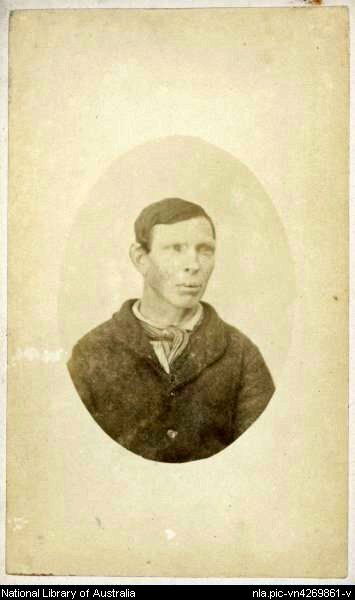 Prisoner John Conlan, also known as James Conlan (mispelt as Conlaw at the NLA where this mugshot is held) was photographed by T. J. Nevin on 16th December 1874 at the Hobart Gaol when Conlan was discharged from a four year sentence for larceny. He lived as a pauper but was believed to have hoarded a fortune on his death. One of two fraudulent claimants who forged the will, James Marchant Frazer, received a sentence of six years for forgery on 26th July 1895. 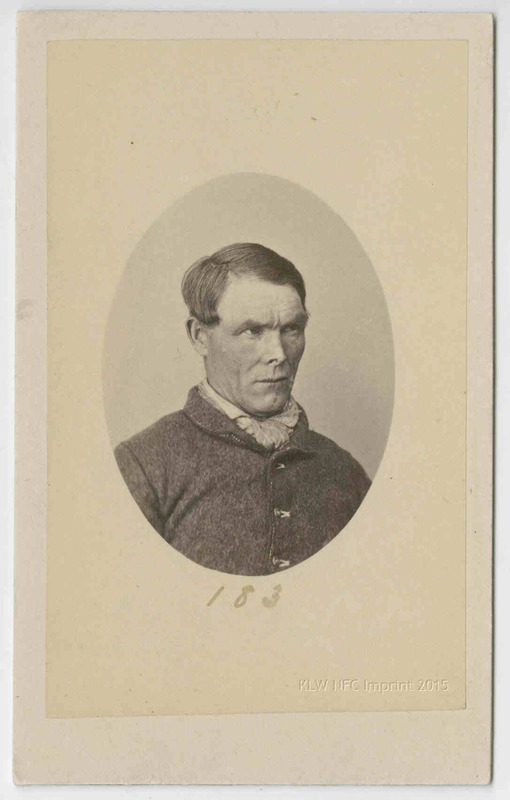 A first offender, prisoner Thomas Clark and his co-arsonist George Campbell (see below), were sentenced to 4 years in 1896 but discharged in October 1897. 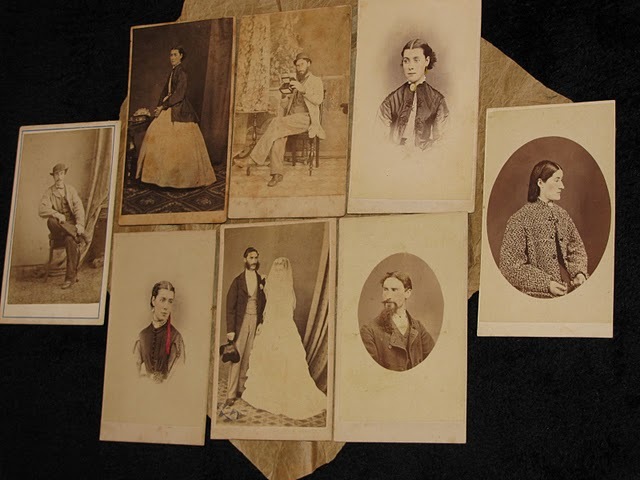 The photographer applied the mugshot methods of Bertillon required by prison regulations by the 1890s in providing a pair of photographs, one full frontal and one in profile, but still printed both photographs in oval mounts typical of earlier commercial carte-de-visite production. Thomas Clark was photographed wearing the prison-issue houndstooth patterned tie with a shirt in the fortnight prior to discharge, but not the full prison uniform. 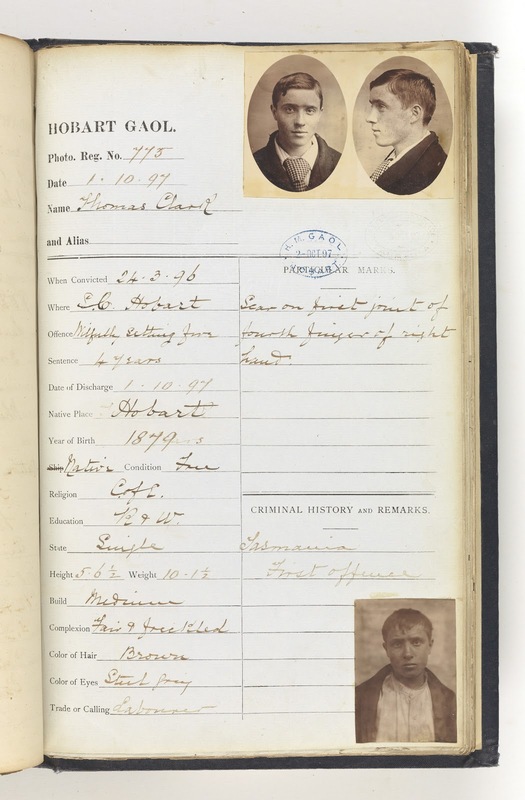 The third photograph pasted to the bottom of his criminal sheet was taken on arrest, wearing the same collarless shirt and coat as his partner in crime, George Campbell, who was an inmate of the Boy’s Training school when captured. 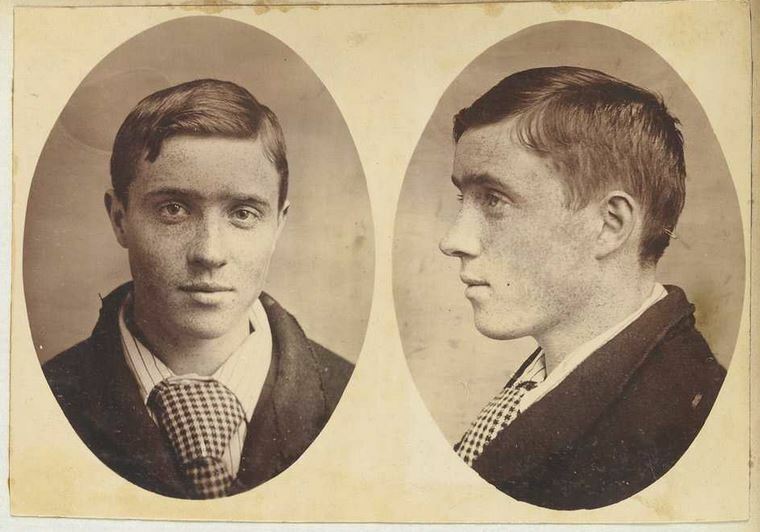 These two photographs (Reg: 776) of prisoner George Campbell, one full frontal printed into an oval mount, the other in profile and unmounted, were taken a fortnight before he was discharged from the Hobart Gaol on 6th October 1897. Although appearing to wear civilian clothes, he was wearing the prison-issue houndstooth patterned tie on discharge. In 1888 he was sentenced to 4 years for larceny, and another 4 years for arson in 1896. 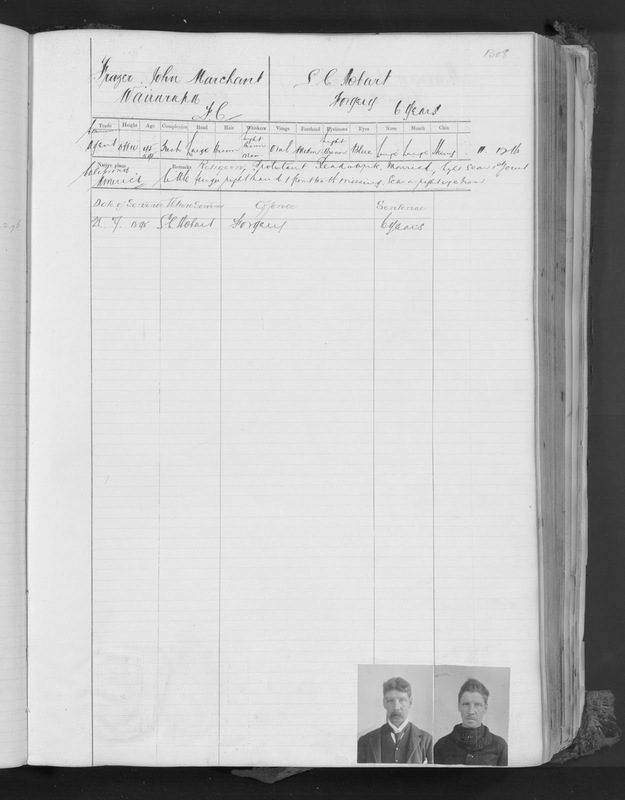 He was sentenced for the same crime and on the same date as the prisoner Thomas Clark (see above), 24th March 1896. 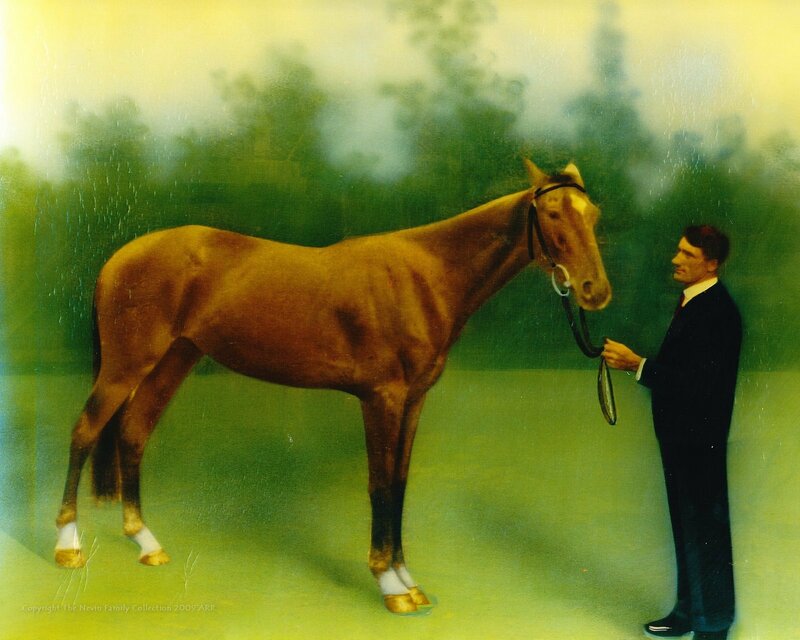 The third unmounted full frontal photograph pasted to the bottom of his rap sheet shows George Campbell as younger, thinner, and wearing his own shirt. It was probably taken on arrest while he was still at the Training School (Boys’ Orphanage). 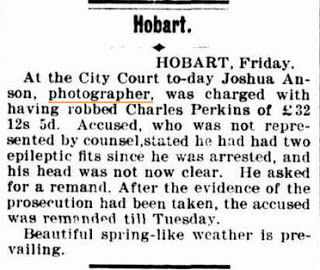 Joshua Anson was indicted for feloniously stealing a quantity of photographic goods from his employer, H. H. Baily, photographer, of Hobart Town on May 31st, 1877. The charge was larceny as a servant. The prisoner pleaded not guilty. Despite the depositions of good character from photographer Samuel Clifford, Charles Walch the stationer, and W.R. Giblin, lawyer and Attorney-General, Joshua Anson (b. 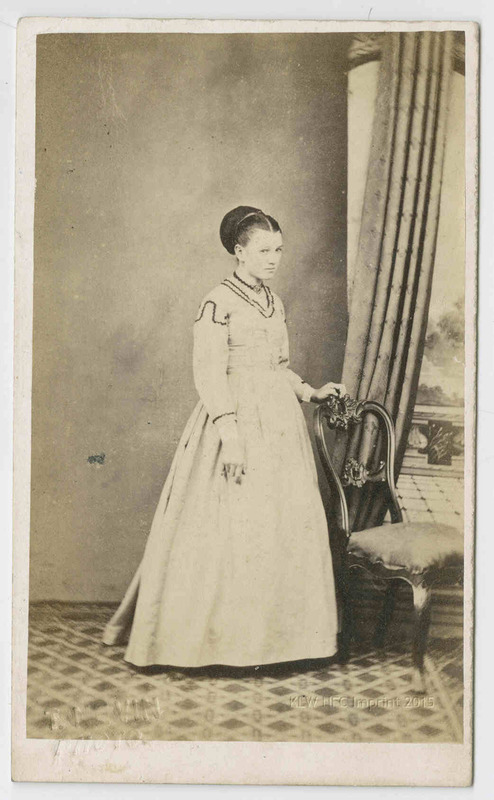 1854, Hobart), was found guilty of stealing goods valued at £88, though the real value of the goods, which included camera equipment, negatives, paper, mounts, chemicals, tripods etc exceeded £140. He was sentenced to two years’ imprisonment, with parole. On July 12, 1877, the Mercury reported that Joshua Anson’s appeal was ” to seek to retrieve his character by an honest career in another colony; and asked that during his incarceration he might be kept from the company of other prisoners as much as possible, though not, he said, on account of feeling himself above them, as the verdict of the jury removed that possibility.” The seriousness of the crime warranted a 14 year sentence, but the jury strongly recommended him to mercy “on account of his youth“. 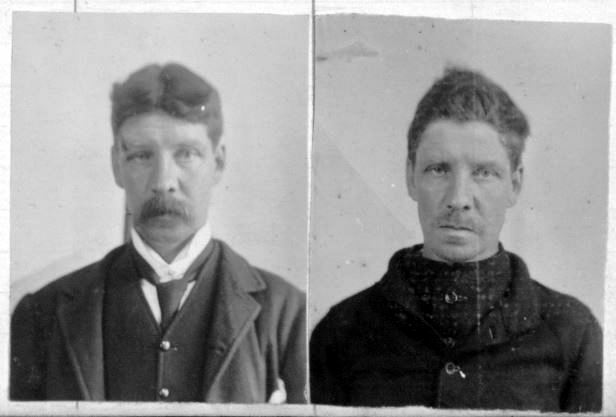 Joshua Anson did not take the two photographs of himself that were pasted to his criminal sheet, the first (on left) in 1877 when he was 23 yrs old, and the second (on right) in 1897 when he was 43 yrs old, nor did he photograph any of the other prisoners for gaol records while serving time at the Hobart Gaol. His abhorrence of the company of convicts was extreme, as his statement testifies. 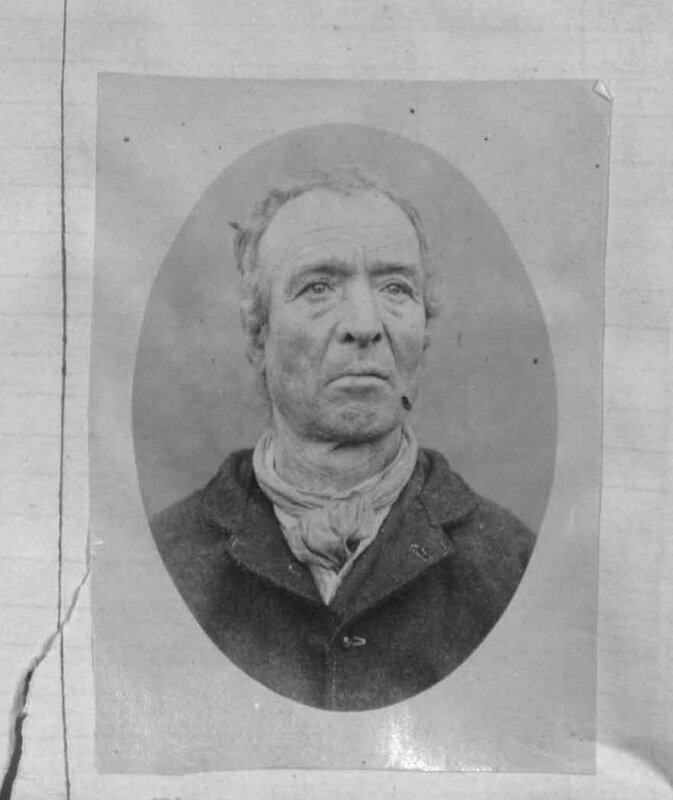 His 1877 prisoner mugshot was taken by Constable John Nevin in situ, and unmounted. 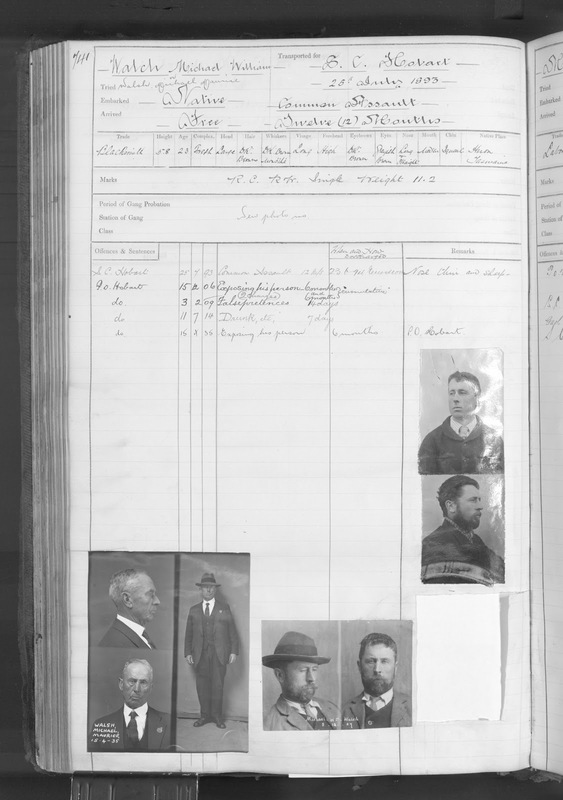 Thomas Nevin may have printed another for the Municipal Police Office Registry at the Town Hall, Macquaries St. Hobart where he was the Hall and Office Keeper, but it is yet to be identified among the Tasmanian prisoner cdvs held in public collections. 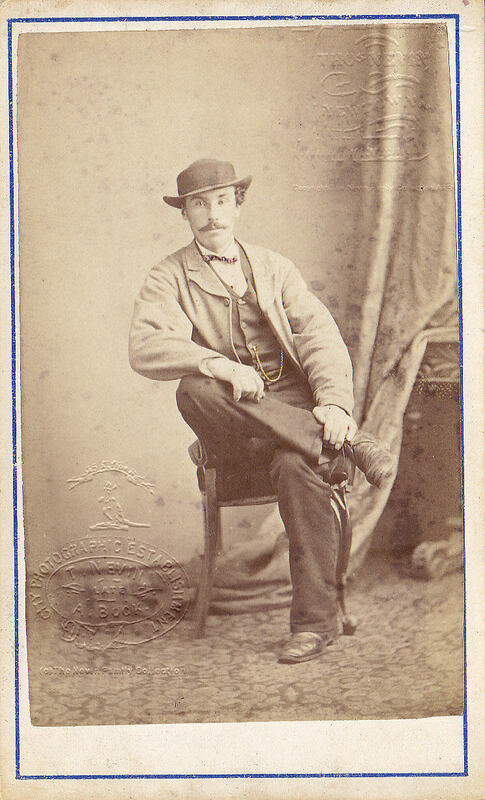 Joshua Anson was certainly the beneficiary of Thomas Nevin’s stock and commercial negatives when Samuel Clifford acquired them in 1876 and then sold them on to Joshua Anson and his brother Henry Anson in 1878. The Anson brothers reprinted Clifford & Nevin’s Port Arthur stereoscopes for their highly commercial album, published in 1890 as Port Arthur Past and Present without due acknowledgement to either Nevin or Clifford. The Launceston Examiner reported another theft by Joshua Anson on 30 May, 1896. The arrest, he was reported to have said, had brought on two epileptic fits. 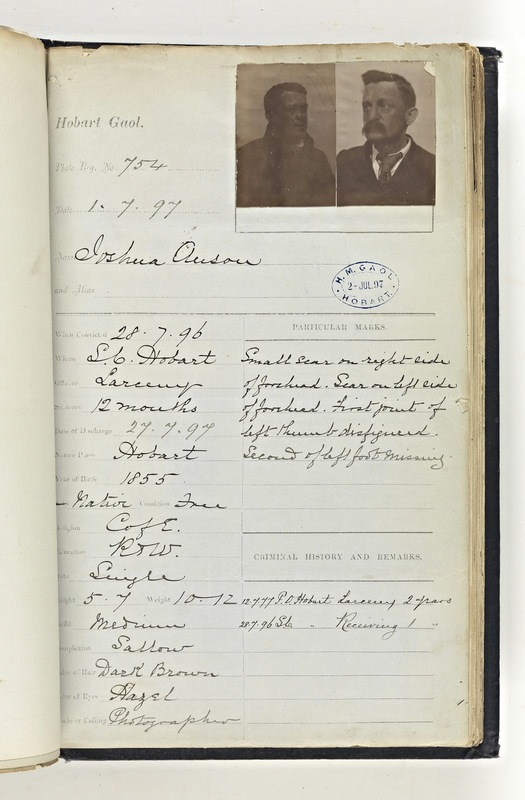 He was imprisoned again at the Hobart Gaol, served 12 months and discharged on 1st July 1897. At the City Court to-day Joshua Anson, photographer, was charged with having robbed Charles Perkins of £32 12s5d. Accused, who was not represented by counsel, stated he had had two epileptic fits since he was arrested, and his head was not now clear. He asked for a remand. After the evidence of the prosecution had been taken, the accused was remanded till Tuesday. Beautiful spring-like weather is prevailing. 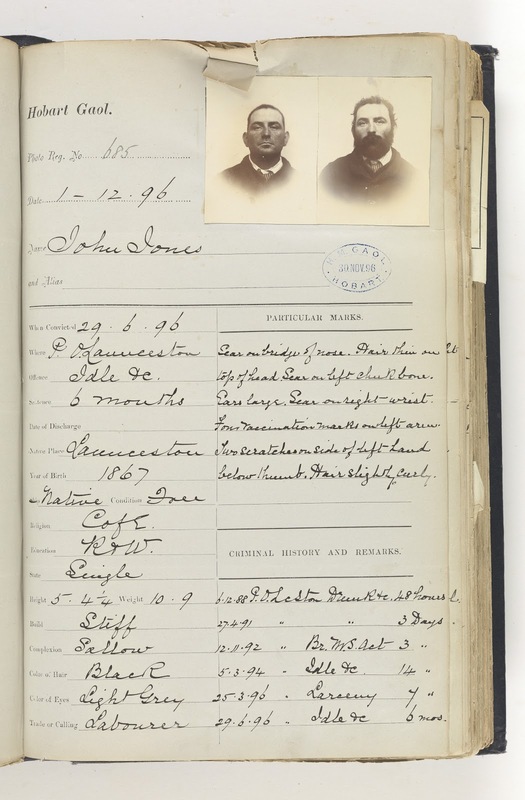 Both photographs taken of prisoner John Jones at the beginning and end of his sentence, June and December 1896, were vignetted (cloudy background) and posed in full frontal gaze. He was photographed as clean shaven with closely cropped hair in the first, taken on incarceration for being idle etc, and again six months later, in the fortnight before being discharged, with full beard, more hair, and still wearing the prison-issue tie. The discharge photo was registered No. 685. 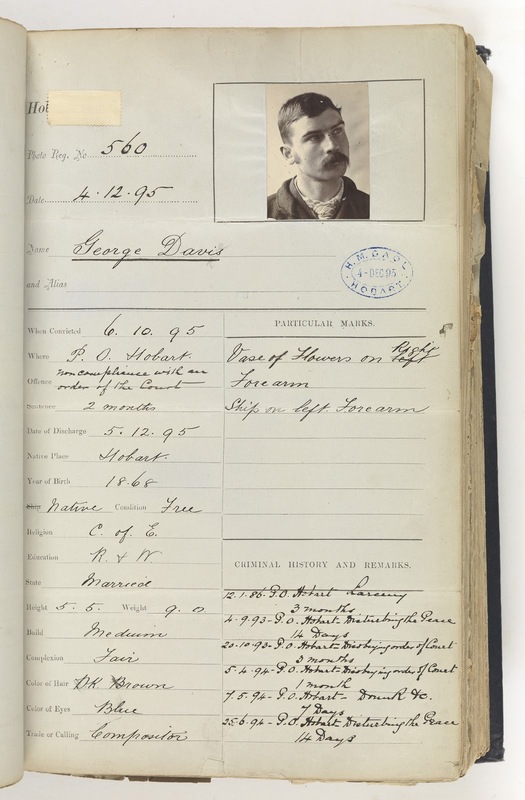 A single photograph in semi profile, with the registration number 560 was taken at the Police Office, Hobart where prisoner George Davis was repeatedly detained for short sentences from 14 days to three months. For some reason, the Hobart Gaol header on this form has been taped over. The prison scarf or tie worn during these last years of the 19th century featured a large lozenge pattern. 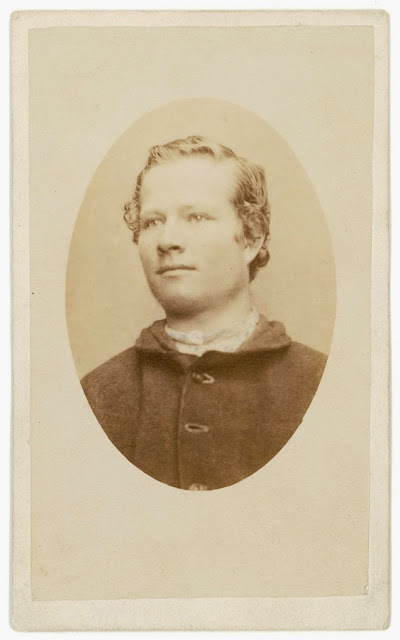 Prisoner James Connolly was photographed in November 1876 by Thomas Nevin at the Hobart Gaol (QVMAG Collection: Ref. No.Q1985_p_0086). 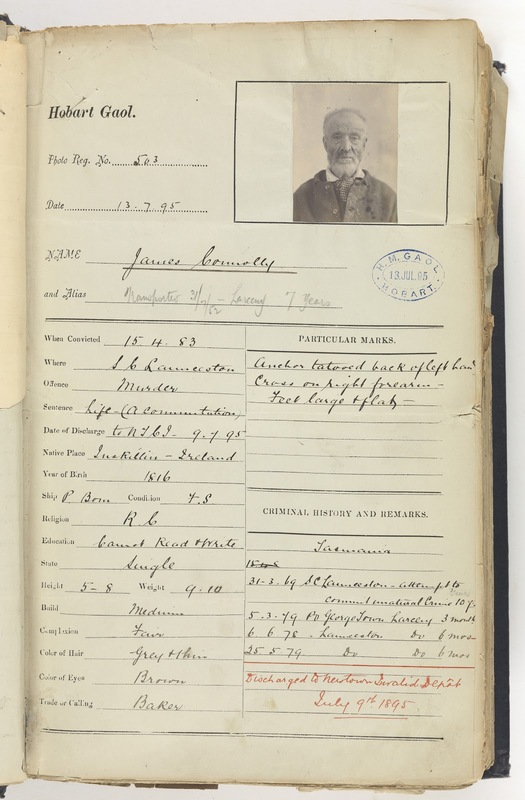 Photocopy of the QVMAG cdv held at the Archives Office Tasmania, Hobart, of prisoner James Connolly, photographed in November 1876 by Thomas Nevin at the Hobart Gaol (P30/1/3231). 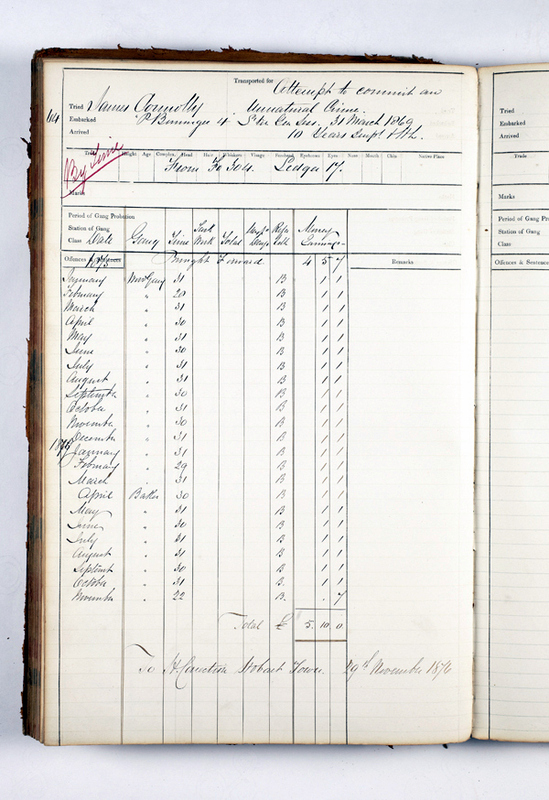 This rap sheet (below), held at the Hobart Gaol and Municipal Police Office, Town Hall, shows a summary of James Connolly’s criminal history from transportation in 1852 for stealing a watch to his last offense – being idle – in 1899 when he was transferred to the Invalids Depot at Launceston where he died in 1900. The photograph pasted to this rap sheet was taken by Thomas Nevin in 1883 on James Connolly’s sentence at the Supreme Court Hobart for the axe murder of Constable William Thompson. His sentence – to be hanged – was commuted to life in prison. 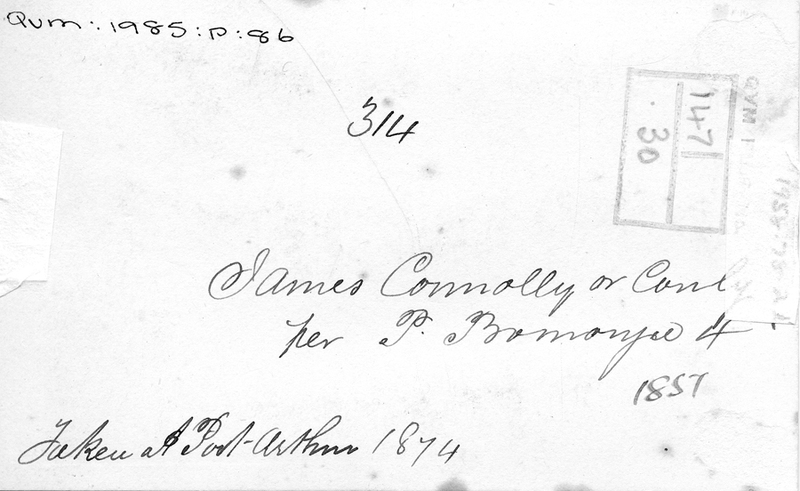 Note the pencilled reference to the earlier photograph of prisoner James Connolly taken by Thomas Nevin in 1876 – For Photo see Photo Book No. 1 p. 54 – next to the boxed word “Sentence”. 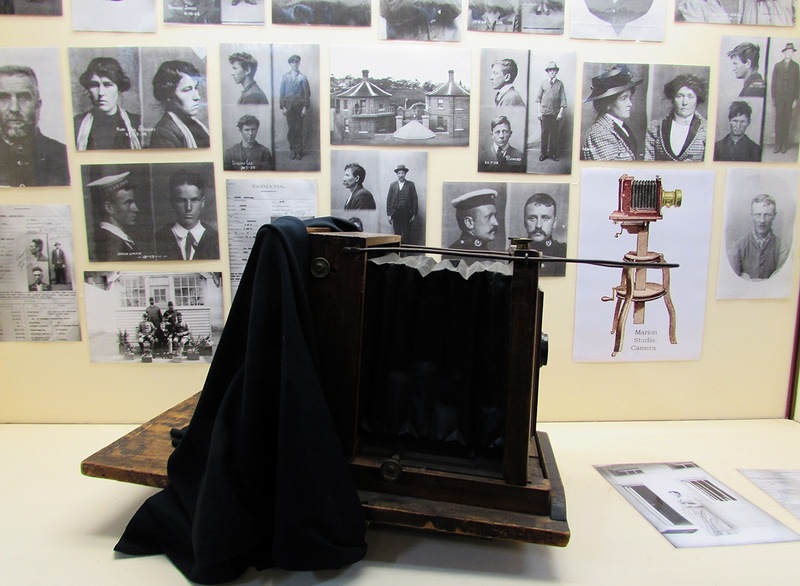 Duplicates from Nevin’s glass negatives of these sittings with prisoners dating from the early 1870s onwards were kept at the Municipal Police Office, Town Hall and Hobart Gaol where they were collated into separate mugshot albums, designated and sequenced as “PHOTO BOOK No. 1…” etc. This last photograph, a single full frontal image, registered as No. 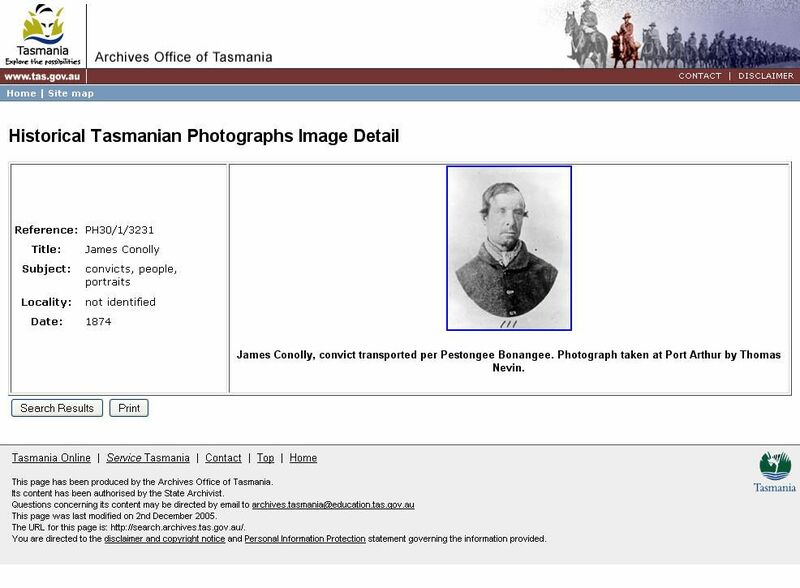 503, was taken at the Hobart Gaol on James Connolly’s transfer to the New Town Invalid Depot in July 1895. A short hand-written record of his criminal history was pasted over a duplicate of the first sheet. 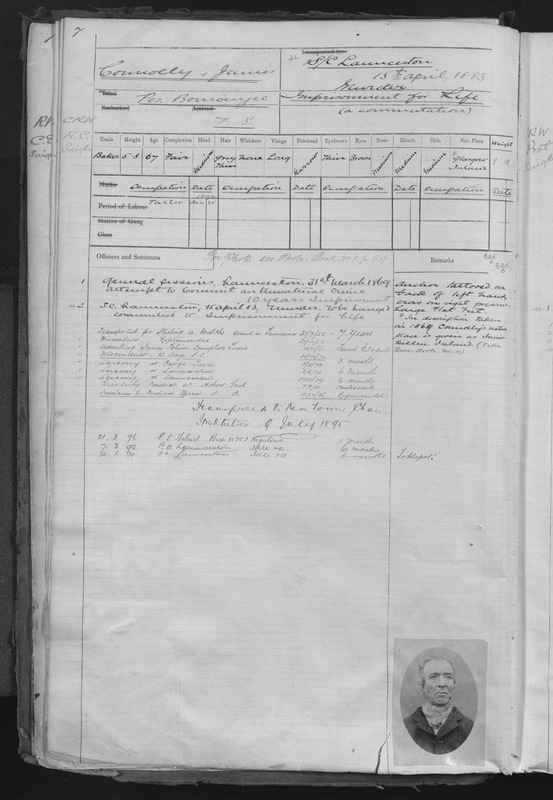 This record gives a registration number for the photograph – “B1”. 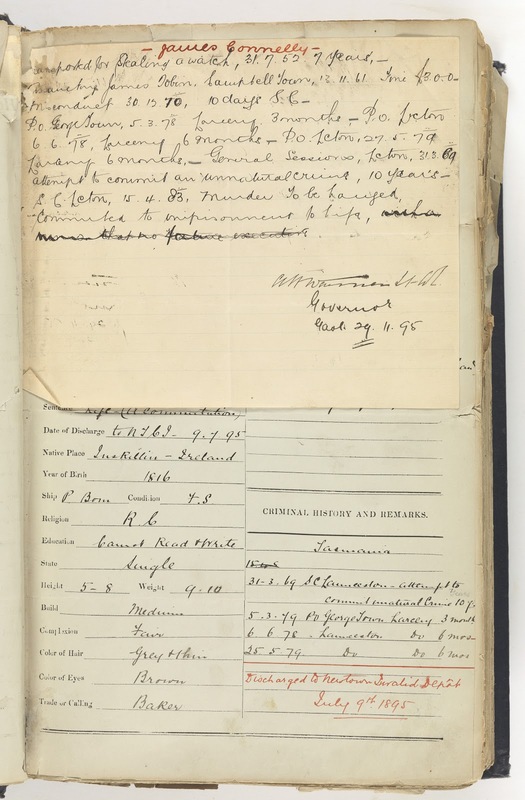 Prisoner Michael Charlton was convicted at the Police Office Hobart on 21st December 1900 and discharged on 5th January 1901, serving a sentence of three weeks at the Hobart Gaol for “obtaining passage by sea” which presumably meant he was caught as a stowaway. 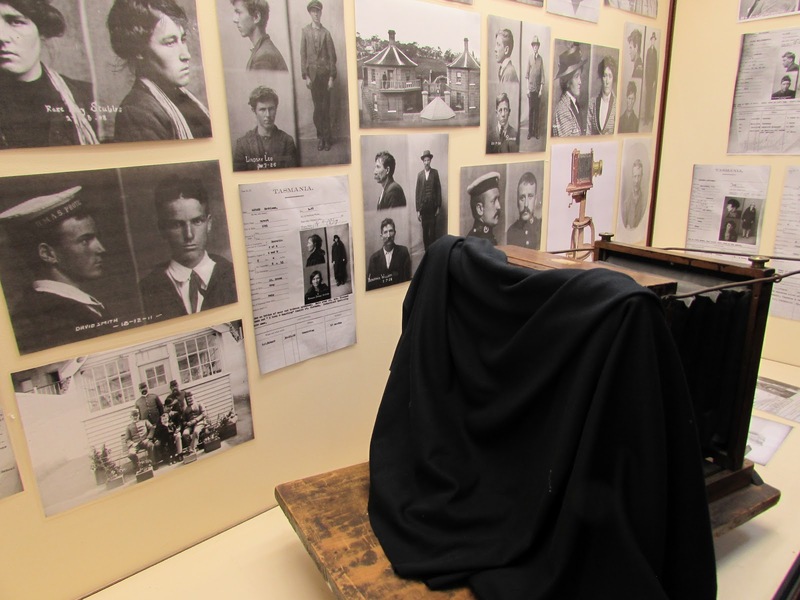 The two photographs, one full frontal, and one profile, were taken according to the Bertillon method in the same sitting on conviction at the Police Office, and printed with the date of the sitting “21-12-00” across the bottom of the photograph in profile. Extensively torn from use, and rotted from poor storage, the book was salvaged from the Hobart Gaol, transferred to the Archives Office Tasmania in the 1950s. 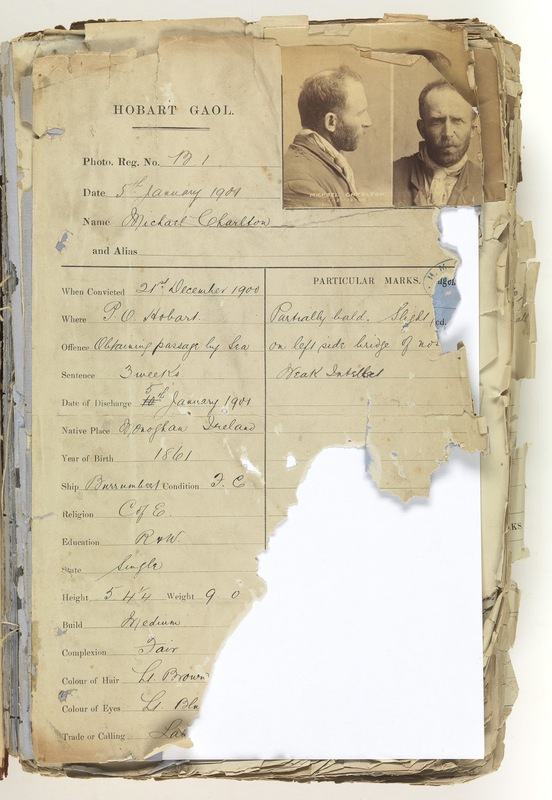 This buff coloured page was pasted onto the blue criminal record form used by the gaol, visible at the torn edges. These mugshot books are held at the State Library and Archives Office of Tasmania. 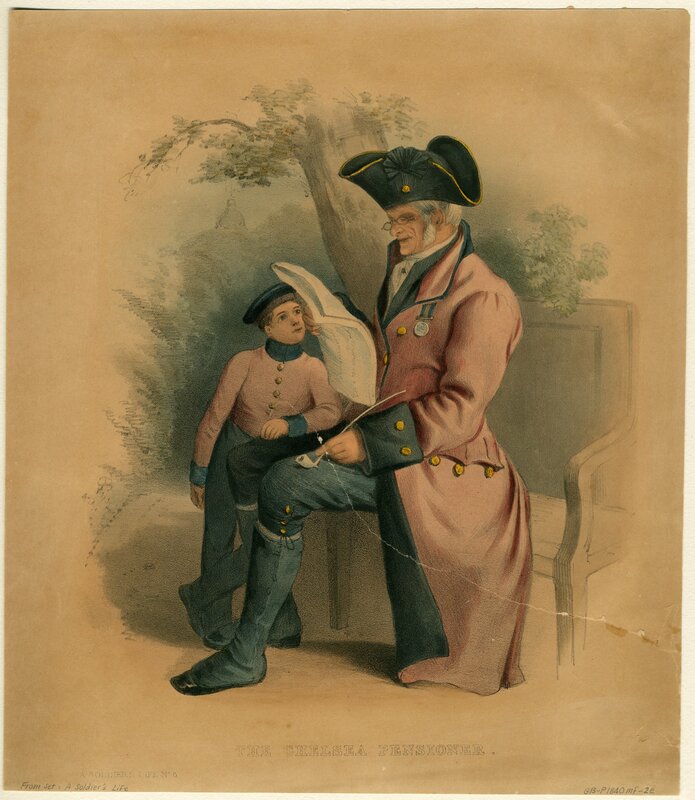 Title: PHYSICAL DESCRIPTION OF PRISONERS RECEIVED. Name, ship, trade, height, age, complexion, head, hair, whiskers, visage, forehead, eyebrows, eyes, nose, mouth, chin, native place; remarks: sometimes include – civil condition, clothing, family, offence, sentence, photograph. The relationship of these volumes to each other is somewhat obscure. There is considerable date overlap and some people are included in more than one volume. Each volume is arranged roughly chronologically. The situation is further confused by the fact that some volumes have been indexed at a later date and marked ‘A’, ‘B’, ‘C’ etc,. not all of these indexed volumes have survived. There is no indication as to why some were indexed and others not, as what differences there are between volumes which have been indexed are also apparent between some of those which have not been indexed. Indexed volumes are: c.1860-74 ‘A’ GD67/1, 1862-66 ‘B’ GD67/2, 1866-70 ‘C’ GD67/4, 1870-77 ‘D’ GD 67/5, c1874-86 ‘E’ GD 67/7, c1884-91 ‘G’ GD67/8, c1892-97 ‘H’ GD 67/11, c1897-1901 ‘I’ GD 67/12, c1934-36 ‘L’ GD67/13 contained in (the back) GD67/7. Generally the same format as CON18.